Ex-NYC, Ex-D&H Heavyweight Diner "Lion Gardiner"
I was recently informed by Dakin Morehouse, Empire State Railway Museum board member and Phoenica Station Master, that the museum wishes to give away their Dining Car "The Lion Gardiner". This car is sitting on the CMRR main line east of Route 209 near Kingston. "That car was D&H 154, originally built for NYC as number 519 by Pullman in 1914. It was air-conditioned in the late 1930s. D&H bought at least two NYC steel diners in the mid-50s, to replace composite (wood-steel) D&H cars. 154 was sold to Empire State Railway Museum, and operated on the 1966-67 HICO trips over the CNJ (powered by CPR G-5s 1278, 1286 and 1238 ). As I recall, William Whitehead and his family ran the diner and actually served "real" railroad diner meals to the passengers! Imagine THAT today! Bill Whitehead was one of the founders of the Black River & Western, and was instrumental in the acquisition of Dansvile & Mt. Morris 565 (AKA D&LW 565, 2-6-0). Anyway, after the HICO use of the car, ESRM sent it to Essex, CT in 1969, where it joined other ESRM equipment as part of the newly-founded Valley Railroad Company. In 1971, the car was painted dark green and lettered "Connecticut Valley", numbered 154, and named "Lion Gardiner", after the early settler of Gardiner's Island (in Long Island Sound). An early use in that set-up was for a publishing party for Michael Koch's "The Shay Locomotive" book in 1972. I remember loading (by hand and ladder) block ice into the roof hatches over the kitchen ice bunker, before a charter trip! The car was getting quite "crusty" around the edges, as early steel cars that had been air-conditioned tend to get. Also, it suffered from the usual "kitchen floor rot syndrome". While everything was there and intact, it was going to be a hell of a costly project to fix the old girl up, and she was shoved into the "woods" at Essex about 1976 or so. A frozen water pipe that had burst and wet down the interior didn't help matters. The car was ultimately sent to the current ESRM at Kingston, NY, about 1986, as part of a negotiated (between ESRM, VRR and CVRM [RMNE]) "deal" for ESRM's various assets (not all of which were rolling stock)." The car moved around with no trouble. As part of this the ESRM is researching the history of the car, and preparing a detailed report on the car for prospective "buyers". Howard Pincus' report above has been an excellent start. I plan to help by taking some more photos as soon as I get to the car on a sunny day. As mentioned above, the ESRM would prefer to have this car sent to a new home rather than scrap it, and though there is no hard deadline, there is a feeling that there needs to be some resolution soon. Though it is blocking the CMRR's main line, it can also be taken up the line to West Hurley when the other cars are moved and stored on the siding there to get it out of the way. What is really needed is an independent assessment of the condition of the car, so prospective restorers could have some idea of what they would be getting into. Perhaps someone knowledgeable in this area could go to Kingston, see the car in person and make such an evaluation as part of the process of finding the car a new home. Anyone who wishes to communicate directly to the ESRM should contact Dakin Morehouse who is in charge of resolving this issue. Dakin is the Station Master at Phoenicia and an ESRM board member. Please contact me privately for Dakin's email and phone number. The ESRM wants to get the word out as widely as possible about the availability of this car so that if it has even a remote chance of getting restored, that chance is offered rather than the alternate of scrapping the car. I'm surprised to heqar of this since the museum was at one time very proud of this car and looking forward to a time when it coule see service on the old U&D. Considering the NYC heritage of both car and line, perhaps a second look/reconsideration is warranted? Hands-down a restored NYC diner would be a highlight of any future train service. You are entirely correct in that it would be appropriate for the line. It is an authentic NYC diner, and I'm sure the Empire State Railway Museum envisioned a dinner train, with former LS&I No. 23 in the lead, coming up to Phoenicia from Kingston with this dining car as its centerpiece. I am sure that will eventually happen, but most likely without the Lion Gardiner. In the 19 years since it arrived in Kingston, it has had some stabiliation work, but none in the last 10 years. Even with a new round of stabiliation, the diner will continue to deteriorate. The recent effort to clear the CMRR's main line has forced the CMRR and the ESRM to come up with a long term strategy for the 6 cars parked on the mainline. The plan now is to move the cars the CMRR will eventually restore to a siding at West Hurley to open the line. For cars that the CMRR can't restore, the 209 location is better suited for loading a railroad car onto a flatbed truck. Since the current plan is to restore more coaches rather than a diner, that puts the Lion Gardiner last on the list, which means it will be years before we can get to it. Even with a new round of stabiliation, that means further deterioration before it can be renovated. That is whey the decision was made to dispose of the Lion Gardiner. The fate of the other coaches is still being decided. As with the Lion Gardiner, any car that we don't plan to restore in the next 10 years should go to a better home. The CMRR plans to restore the 4322 next, but the decision is still pending on the two CNJ coaches. As for the Lion Gardiner, it will require more than labor - it will take both money and the passion of a group of people who will devote all their time to it for several years. Let's hope we can find such a group. 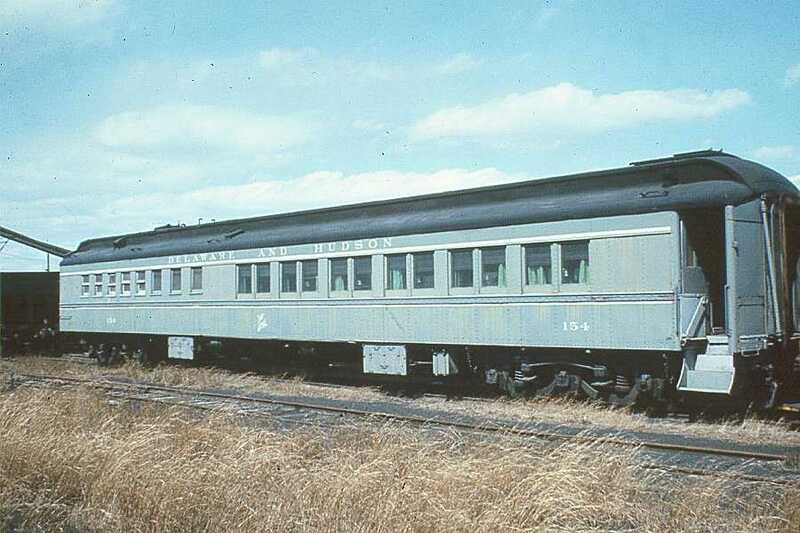 Perhaps museums that have restored former D&H cars such as the one out in the Midwest that did a smooth-side D&H baggage car or the one in St. Louis that has the Loree office car might be interested in this car. I see on the CMRR thread in NY State Railfan that the Lion Gardiner had its brake line charged up in getting ready to move it to the yard in Kingston. Is the plan still to get rid of it or will CMRR be restoring it now (before or after 703 (the old DLW MU), or the two CNJ coaches)? I read this whole thread and didn't realize it was four years old until the post right above mine! pumpers wrote: I see on the CMRR thread in NY State Railfan that the Lion Gardiner had its brake line charged up in getting ready to move it to the yard in Kingston. The car does not belong to CMRR, it belongs to Empire State Railway Museum. There are currently no plans and to restore the car, and at this time, no one has come forward with a serious proposal to save the car. It will most likely be parted out and scrapped. The brake line was charged in anticipation of moving a few cars off the CMRR mainline and into safe storage at Cornell Street Yard in Kingston, NY. Anything new on this story? The shot of the stainless steel kitchen was a shocker, I thought that stuff didn't rust! Dieter wrote: Anything new on this story? The shot of the stainless steel kitchen was a shocker, I thought that stuff didn't rust! It wasn't all stainless! Plus, if you get ferrous particles on a stainless surface, those particles will rust. The Lion Gardiner is still stored on the main, has been moved for volunteer access, but so far nothing has changes. The car belongs to ESRM. The decision on its disposition will be up to them. The CMRR is disposing of or moving all its equipment in storage west of Kingston. To date the two CNJ cars have been sold to the Everett Railroad, and we will be moving former EL 4322 to Phoenicia for restoration. This leaves the Lion Gardiner which currently is blocking our main and can't be brought into Kingston because of a restraining order on the car from the City of Kingston. We need it off the property by July 1st. I myself have pledged funds to the move and we are thankful that the Colebrookdale RR is willing to take on the car. We hope that it can be saved.